Visionary Founder of Drug Discovery in Indian Pharma Industry K Anji Reddy Leaves a Rich Legacy Reviewed by PHARMALEADERS on March 17, 2013 . As clichéd as it may sound, passing away of K Anji Reddy marks the end of an era. Along with YK Hamied and Bhai Mohan Singh, Dr Reddy defined and built the Indian pharmaceutical industry that we know today. “He was a rare combination of a great scientist, entrepreneur, philanthropist and a humanitarian. Passionate about science, compassionate to the core and a true practitioner of giving,” says Dr GN Rao, founder of LV Prasad Eye Institute in Hyderabad, whose own philanthropic efforts at LVP was touched and amplified by Dr Reddy’s help. A first-generation entrepreneur who left a public sector job to start Dr Reddy’s Laboratories in 1984, Anji Reddy took the word “Laboratories” very seriously and pursued his passion of drug discovery till the end. He had set up a lab in his “grape-garden” and would tend to it every day. “Drug discovery is like an addiction…everyday something doesn’t happen but the day you have a dramatic result, you feel that there’s something that could change the way people live. That gives you the real kick,” he said. The last I spoke to Dr Reddy was in October 2012. I was writing this story on Cipla’s YK Hamied and wanted his perspective since he had started his business with projects from Cipla and had shared a relationship with Hamied that lasted 35 years. Even though he wasn’t keeping too well he agreed to chat. “Talking about Hamied is like having tonic, I feel good,” he said, with a hearty laugh. In fact, there was even a tinge of regret – Hamied was older than him but in much better health. “When we recently invited Dr Hamied to inaugurate our R&D Lab in Cambridge, he himself drove down from London…he is so healthy,” he said. Dr Reddy had a fascination for drug discovery. In 1993, DRL became the first company to set up a dedicated R&D center and he recalled how within first 2-3 years he licensed three molecules to big pharma. Several years later and even after stepping down as chairman of the company, he remained passionate. “Making one more generic drug doesn’t give me any kick,” he said. Dr Reddy put “his personal money” behind this drug research. It was supposed to enter phase I trial two weeks later. We hope the drug trial marches ahead but even if it fails, it’d fulfill his dream of “failing gloriously”. Perhaps Dr Reddy understood that a solid R&D foundation can sustain a company for several generations by continually adding new products to the pipeline. He admired the book, “Built to Last” and wanted to nurture his company just like the American family built Merck. “I want to build a company that’d last 500 years, Merck is 640 years old,” he said. So serious was he about following Merck that when DRL struck a deal with the multinational for a monoclonal antibody, Dr Reddy hosted the head of the family of the 13th generation and got his own family to know the history of Merck’s family organization. For an entrepreneur who “wanted to create a Merck in this country”, we hope the industry tribulations are just a passing phase! Following the demise of Dr K Anji Reddy, founder of Dr Reddy’s Laboratories Ltd, the future of the company has come under sharp focus. Speculation is rife that DRL will end up as another Ranbaxy, the country’s largest pharmaceutical firm, which was acquired by Japanese major Daiichi Sankyo within a few years of death of its owner, Bhai Mohan Singh. The firm’s minority shareholders often sought to know why promoters did not deem it fit to up their stake despite several chances. Currently, the promoters hold 25.61 per cent — 23.08 per cent stake through Dr Reddy’s Holdings Ltd and 2.53 per cent stake through other entities and shareholders consider it vulnerable for a takeover. “In 2008, the promoters decided to increase their stake when the share price was `697. But the company withdrew the proposal. Later, the company could have increased the stake when the share price was much lesser at `350. Isn’t there a threat from other companies to takeover?” Rajesh and investor from Chennai asked during the company’s 26th AGM. As if the stake sale buzz was not enough, DRL once again became a soft target for street over alleged differences between the current management and senior Reddy over change in firm’s business direction. Anji Reddy was passionate about discovering new drugs, but in stark contrast, the management last year folded up the drug discovery programmes initiated by Reddy in areas like diabetes and cardiovascular diseases. These include the path-breaking cardiovascular drug, CETP inhibitor,- which Reddy excitedly spoke of in 2010. DRL has also shelved a project on type-2 diabetes molecule, balaglitazone, after nine years of research. Interestingly, balaglitazone (named after Lord Balaji) was the first lead molecule to come out of DRL’s drug discovery research programme which started in 1994. “In this industry, we have to accept failures. The class of compounds in which it falls is itself complex. We are unable to find a partner to take it forward,” Anji Reddy had once told Express. For the first time in the history of DRL, sending out the strongest hint of a transition the company he founded, Anji Reddy, chose to give the company’s Annual General Meeting a miss. K Satish Reddy, MD and COO, who read out the chairman’s message at the AGM, said Reddy was unwell, but for shareholders it was an unspoken truth that succession was happening. A farewell for Dr Reddy’s Laboratories founder chairman Anji ReddyA host of Andhra Pradesh businessmen and leading politicians were among those who bid adieu to Dr Reddy’s Laboratoriesfounder chairman Anji Reddy before he was cremated at the Panjagutta cremation grounds on Saturday morning. Union tourism minister K Chiranjeevi, Union minister for science and technology and earth sciences Jaipal Reddy were among those present at the cremation of the DRL founder, who passed away on Friday afternoon after a prolonged illness. In fact, on Friday evening itself as news of Dr Reddy’s passing away filtered into the Confederation of Indian Industry’s Andhra Pradeshcouncil meeting, the AP Inc top honchos interrupted the meeting to mourn his death and many even rushed to pay homage. Expressing their grief at the sad demise of the pharma doyen, top honchos of AP Inc said that India had lost one of its greatest business leaders, who had not only injected the thrill of ‘innovation’ in drug discovery but also inspired numerous budding entrepreneurs to dream big. “He was the first Indian to stress on research and development (R&D) in drugs and he attached great importance to innovation that would help make drugs affordable for the masses,” said Bharat Biotech chairman and managing director Krishna M Ella. “Dr Anji Reddy was a visionary, a respected leader in the Indian pharmaceutical industry and an inspiration to all of us. His work made a significant impact in the lives of many people both in his company and the society at large,” said Aurobindo Pharma vice chairman K Nityananda Reddy. Noting his tremendous contribution towards the building the pharma industry to what it is today,Natco Pharma director and chief financial officer P Bhaskara Narayana said that Dr Reddy had struggled to bring new generation medicines to the suffering masses. “He is in a way responsible for today’s Indian pharmaceutical industry. He inculcated, nurtured and developed entrepreneurial spirit among a host of ambitious scientists. 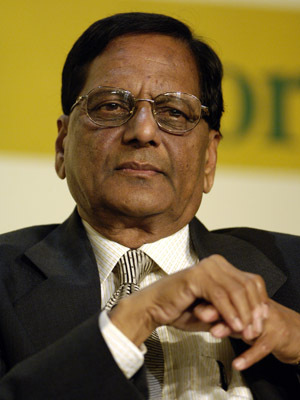 Thanks to him, Hyderabad is today the pharma capital of India and a reliable quality drug store for the world,” Narayana said. Infotech Enterprises chairman and managing director BVR Mohan Reddy described Dr Reddy as a simple man, who used to maintain a very low profile. “By establishing DRL, he not only helped in employment generation but he created wealth for numerous investors around the world as DRL was one of the first Indian companies to be listed on the New York Stock Exchange (NYSE),” he said. According to Indian Immunologicals Ltd deputy managing director K Anand Kumar, Dr Reddy was one of the pioneers of the pharma industry whose work inspired many entrepreneurs to set up companies in Hyderabad. Dr Kallam Anji Reddy, founder of Hyderabad-based drugmaker Dr Reddy’s Laboratories (DRL) and pioneering pharma entrepreneur who passed away on March 15, loved a challenge. This son of a turmeric farmer from Andhra Pradesh was in his element when faced with a seemingly intractable problem or hopeless cause. Whether it was discovering a breakthrough new drug for diabetes in his company’s labs, or supplying safe drinking water to rural India through Naandi, the philanthropic organisation that he helped found, Reddy was always ready to pick up the gauntlet. Life did full justice to his enterprising spirit — it threw several challenges his way all of which he gamely tackled. What stood Reddy in good stead were his incurable optimism, his passion, his trust-and-delegate management style, and his ability to continuously seek inspiration. Of the first two there is ample evidence through his career. In the 1980s, when the homegrown private sector was not the dominant force in pharmaceuticals that it is today, his fledgling drug company embarked on the road to reverse-engineer the best-known drugs of western multinationals (MNCs) at a fraction of their prices. He went after the most tough-to-produce ones; his first choice was blood pressure drug methyldopa. The innovator, US-based MerckBSE 0.74 %, whom Reddy hoped to supply to, believed no Indian company could pull it off. Reddy was alien to such pessimism. His team hunkered down to the task and DRL eventually became the MNC’s biggest supplier of the drug. In the 1990s, as India moved inexorably to a tougher patents regime, Reddy decided it was time for his company to discover its own patentable drugs and get into the elite club of innovators. This was a whole new ball game — expensive, time-consuming, and with little chance of success. It was just the kind of venture that would appeal to Reddy. Here too, his optimism and passion carried him through. If his scientists found that a promising drug candidate emerging from the lab was already patented a few days earlier in another part of the world, Reddy would cheer them on with the view that thousands of kilometers away scientists were thinking along the same lines as they were. Over the next decade, his team would license three new potential drug candidates to MNCs for further development. Unfortunately, none of these made it to market for a variety of reasons. Then, investor concerns forced the company to pedal down on its new drug research activities. Reddy was, indeed, disappointed. In a telling moment, he once likened drug discovery to “a spiritual pursuit beyond bottom lines and investor relations”, revealing his passion for it and betraying thinly veiled angst against the stock market’s impatience with his discovery efforts. But he recouped and continued his efforts, albeit in a smaller way. His belief and ingenuity led him to partner the former chief scientific officer of DRL in a private company that did research he wanted to back. In parallel, he helped set up a multi-disciplinary science institution in Hyderabad in a tie-up with the state government. This passion for achievement was matched by a passion to do good. He once told me: “We must show there is good in society. If you read the newspapers you think there are only crooks in this world but that’s not true.” Naandi, a non-profit he helped found in 1998, wanted to bring change in areas such as education and drinking water. Rapid scale seemed impossible without some sort of partnership with the state.